Remember me? Things have been a little bit quiet on here of late. A new job and a move down to that-there-London (in my line of work it was almost inevitable) has meant the blog has fallen by the wayside, but I've been spurred into action by a stonker of a dish that I really want to shout about. The star of this post is my take on the classic Argentinian sauce-for-steak-or-other-grilled-meats, chimichurri. 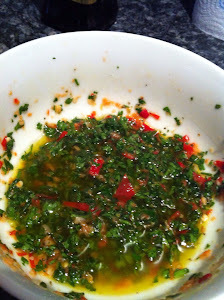 Essentially a sort of south American pesto, the key ingredients of this sauce are fresh parsley, garlic, salt and olive oil, but my version also includes a finely chopped red chilli, dried oregano and red wine vinegar. Served spooned over a flash fried or barbecued steak it is quite simply stunning. The parsley infused olive oil just works so well with the charred edges of the meat and the heat of the raw garlic and chilli, combined with that little bit of vinegar, cuts right through the fatty richness of the steak. It's one that really needs to be tried to be believed. 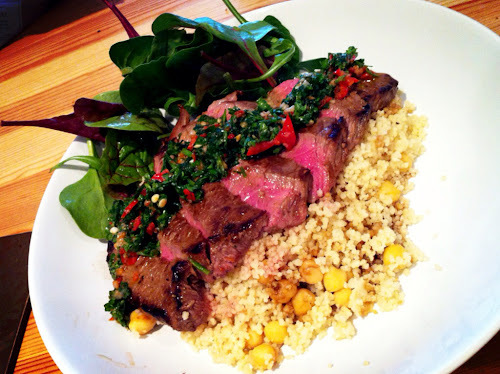 (I ate it with rump steak and some cous cous cooked with chicken stock and chickpeas). It goes without saying that your steak should be aggressively seared then well rested. To make my chimichurri (this makes enough for two decent sized steaks) finely chop two cloves of garlic and a large sized medium heat red chilli, then add to a pestle and mortar along with a good grind of coarse sea salt and grind to a smooth paste. Next add a good pinch (about half a teaspoon) of dried oregano, one tablespoon of red wine vinegar, one of cold water, three to four tablespoons of good olive oil and a good handful of finely chopped curly parsley. Stir to combine and season to taste before leaving to infuse and meld for half an hour or so. It should be fragrant, salty and have a nice bit of heat in the aftertaste, but shouldn't blow your head off. No one flavour should dominate. There are some big flavours in this dish so you can go fairly big with your beer choice too - A hop forward beer works well with fresh chilli (not so much with spices) but you also want something with just a touch of malt sweetness to sooth out the heat. I went with a fruity, juicy yet bitter Kernel Pale Ale Columbus and it worked really well. The citrus and pepper of the hops dovetail nicely with that chilli and garlic, but there's also a fresh almost grassy side to the beers flavour profile which works well with the parsley and olive oil. The beer match was good, the steak sauce is amazing. You have to give this one a try for your next BBQ. do you really mean two bulbs of garlic? Ah, wonderful stuff! I almost only ever eat it in the summer though - must rectify that! I really love the taste of the steak sauce. It makes my day ever since.